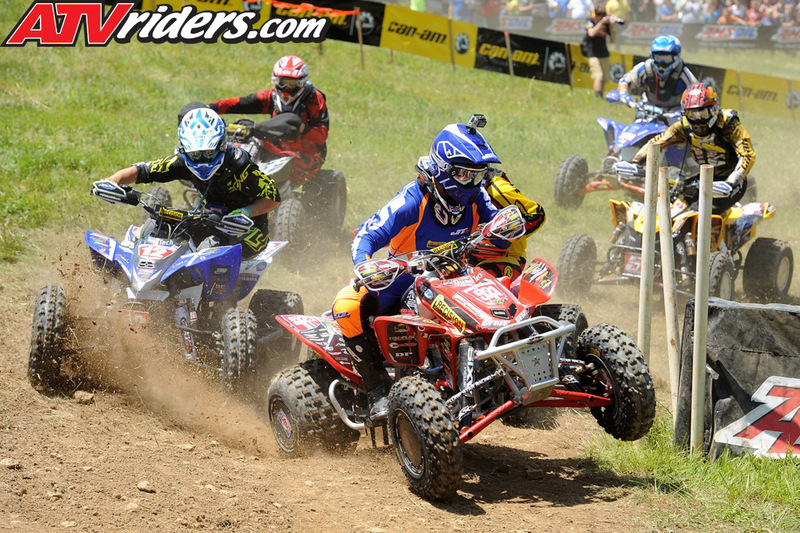 Masontown, WV – Precision’s Adam McGill made a statement in his home state of West Virginia on Saturday when he took the win after a nail biting battle to the finish. McGill was followed by HMF’s Chris Borich and Reliable Tool Supply’s Chris Bithell. The excitement took place at the second running of the Mountaineer in Masontown, West Virginia. 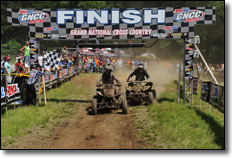 The eighth round of Grand National Cross Country racing featured mountainous terrain, sloppy mud sections and a lot of rocks. Adam McGill started his day by grabbing the Team Woodhead / DeRisi Racing Holeshot award and led the pack of pros into the woods. McGill put the hammer down and gapped second place by 31.437 at the end of lap two. He continued to charge even as Chris Borich and Chris Bithell closed the gap on him. McGill did lose the lead for a few miles near the end of the race, but in true McGill fashion put on an exciting show as the finish line approached. 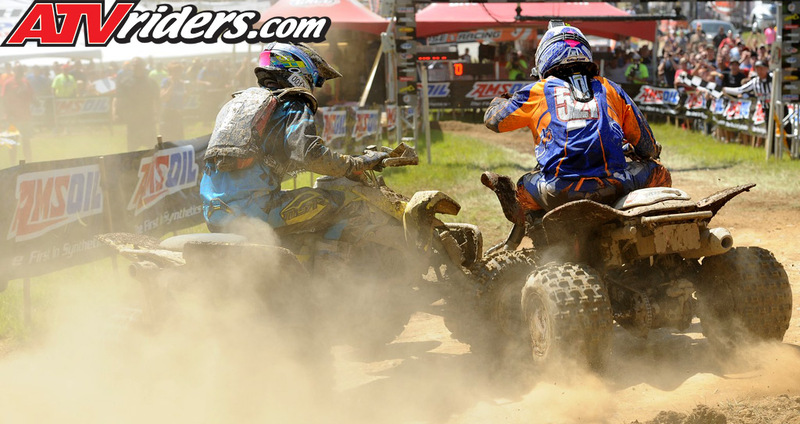 McGill came flying through the last few turns with Chris Borich just a wheel behind him. The two bumped and banged all the way till the final turn. Borich tried to take the inside line and in an effort to block him McGill cut in close. 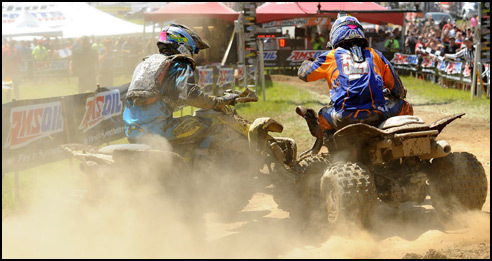 With so many quads and so little space, Borich drilled the side of McGill’s ATV. The pair seemed to lock up for a second, before McGill was able to move forward and take the win by less than a half a quad length. 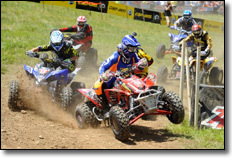 The fans went wild, excitement was abundant and adrenaline was pumping for both the racers and the crowd. “The planets lined up, the moons, the stars and all that stuff; it was just a good day. I couldn’t have asked for much better. My Baldwin engine was ripping all day, all the Lonestar components were flawless and my ITP tires hooked up everywhere,” regarded McGill from the podium. This is McGill’s first win of the season and the win boosted him to second in overall points. 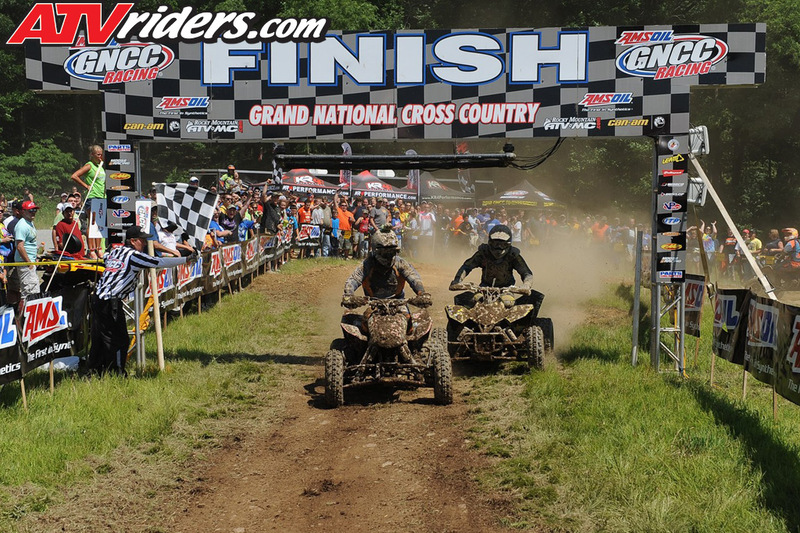 Maxxis Tire’s Chris Borich had an exciting race, crossing the checkers in second. He rode in second and third for much of the race before a thrilling end of the race battle with McGill.